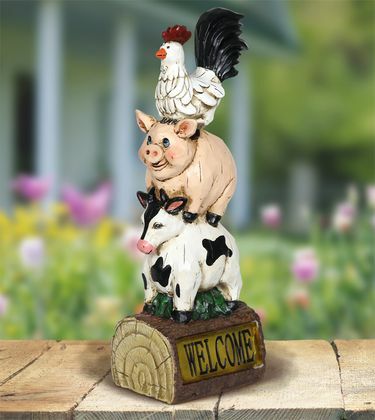 This charming Solar Stack of Welcoming Farm Animals adds a cheery and whimsical accent to your garden. Solar powered LED light will illuminate at dusk highlighting the uniquely crafted and hand-painted statuary. This adorable garden art enhances your farm style decor with utter delight. Size: 5.25" x 4.25" x 14.75"H., approx. 3 lbs.